Home / French National Championships. In the last major event of the European season, and a final chance to get some competiton action for those not going to the Worlds. Laurent Stephany reports. 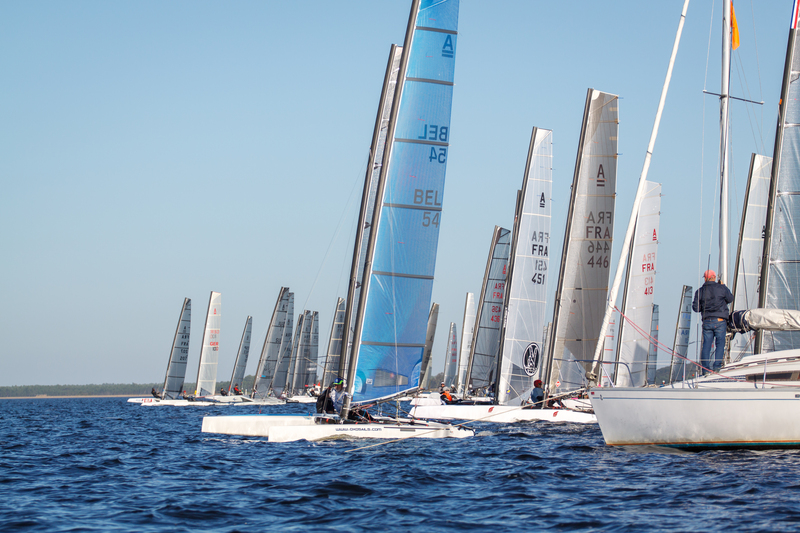 Wednesday October 24 - To open the event, the weather has offered competitors a Northerly 6 to 9 knots wind in a sunny sky. 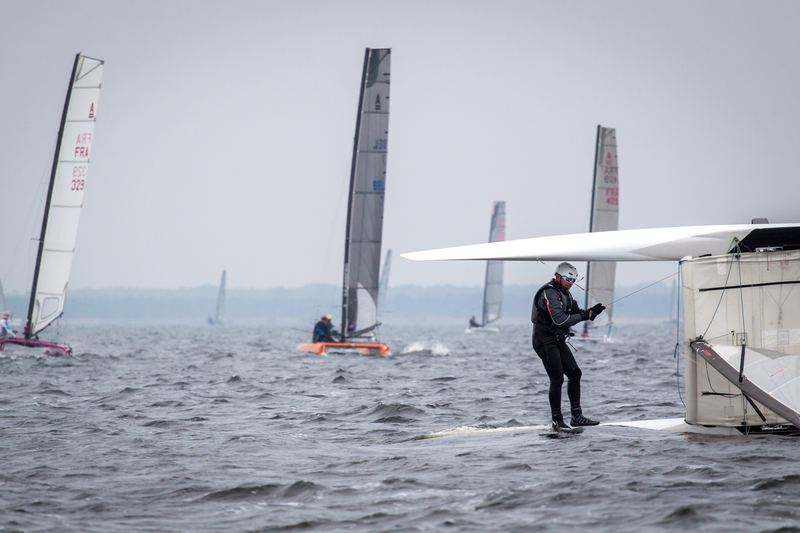 In these conditions the fleet was able to run three races and all competitors were able to show their talents. 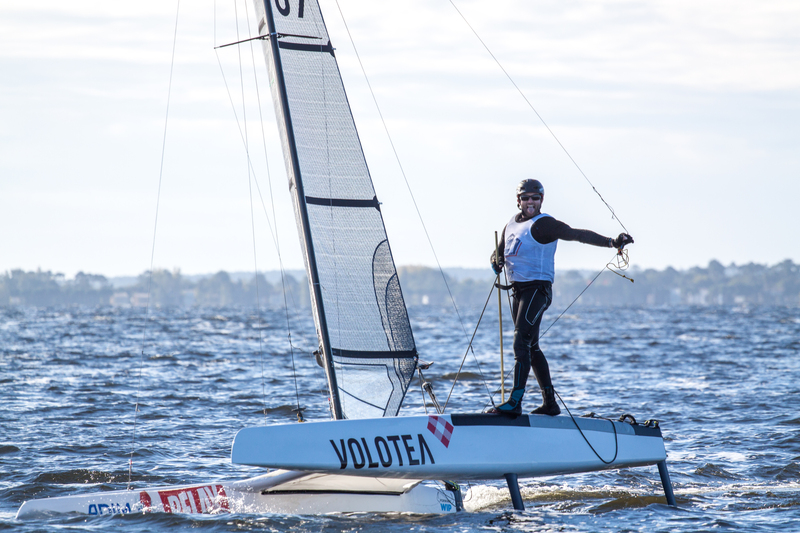 After three rounds, Benoit Marie led the Foilers, ahead of Mike Modlhammer and Emmanuel Dodé. While in Classic Division, Micky Todd led from of Albert Roturier and Emmanuel Le Chapelier. Thursday October 25 - As the wind gods were not helping, it was decided to asked the committee for a delay and to send the competitors on the water at 13:00. In the mean time the sun dissipated the mist. But the North-North-Westerly wind was 6 knots easing 4 to 5 knots in the late afternoon so no racing. As a result the positions remained the same. Friday October 26 - After two days of weak winds, in the middle of the afternoon, the wind decided to come back. 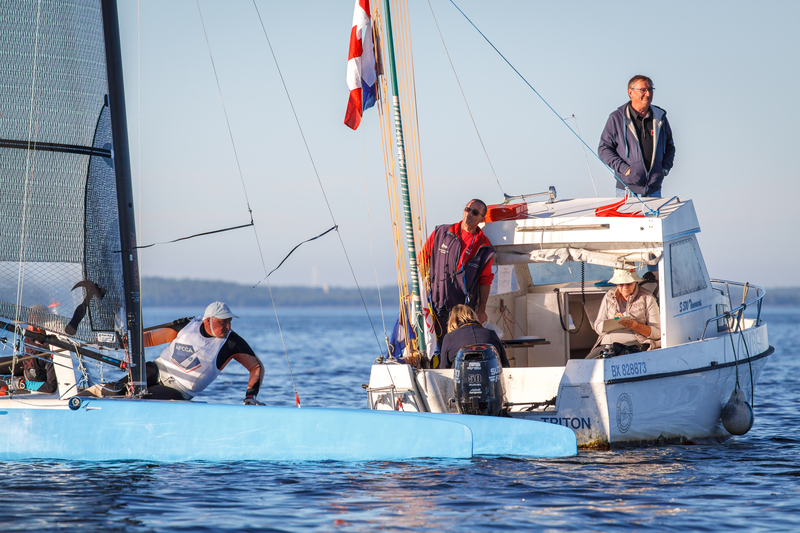 The fog dissipated in the NNW 12 to 15 knot wind and beautifull sunny weather meaning that two races were run. 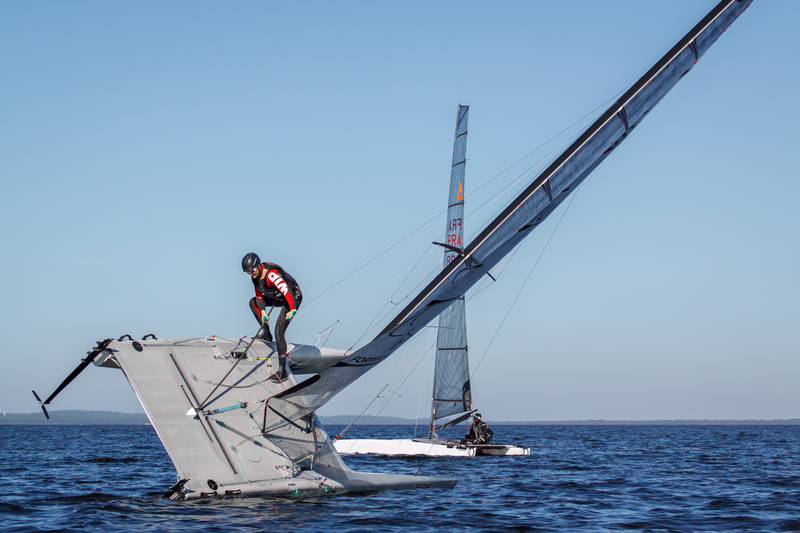 In these conditions, competitors helming modern boats, have been able to test themselves (fully for the best, more modestly for those whose technique is not yet well mastered). 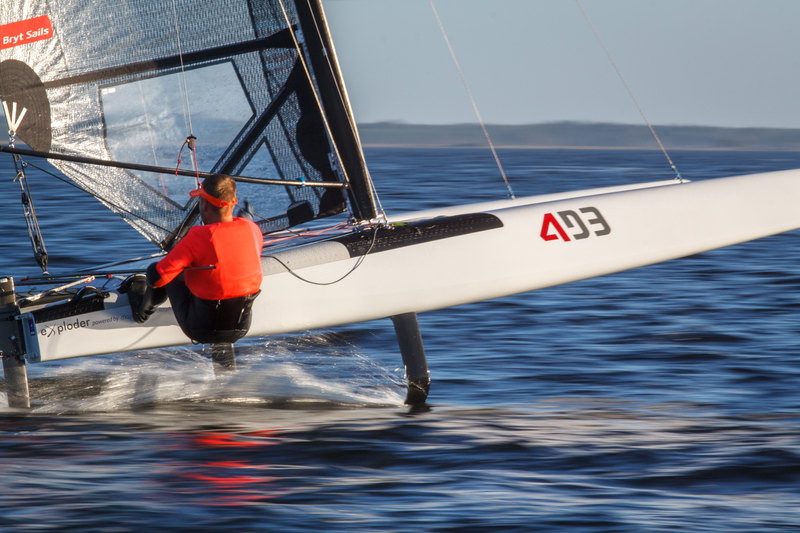 Iago Lopez Mara impressed everyone with his speed in the breeze and did the foiling show with Benoit Marie and Emmanuel Dodé. Behind them, Mike Modlhammer, Matthias Dietz, Gert-Jan Kos, Vladislav Ptasnik, Lars Schroder, Loic Dony and Jean Darnaude did not let anything go either. The leading Classics was Micky Todd and Christian Stock, Philippe Muyzers, Albert Roturier were following, hull flying with the perfect technique (your writer also for example). However, Emmanuel Le Chapelier and Hervé Ledue were victims of breakage, just as Sandro Caviezel who, for the second day in a row, broke his cunningham. Saturday October 27 - The next day, the beautiful summer conditions that prevailed were faraway and at 10:00, in grey cloudy weather and with a temperature 10° lower than the previous days, competitors were under committee orders. The NNE 10 to 13 knots wind was cold. Benoit led the foiling dance with Iago, followed by Emmanuel and Sandro whose cunningham was finally repaired. For the third race of the day the NNE wind was easing 5 to 6 knots. 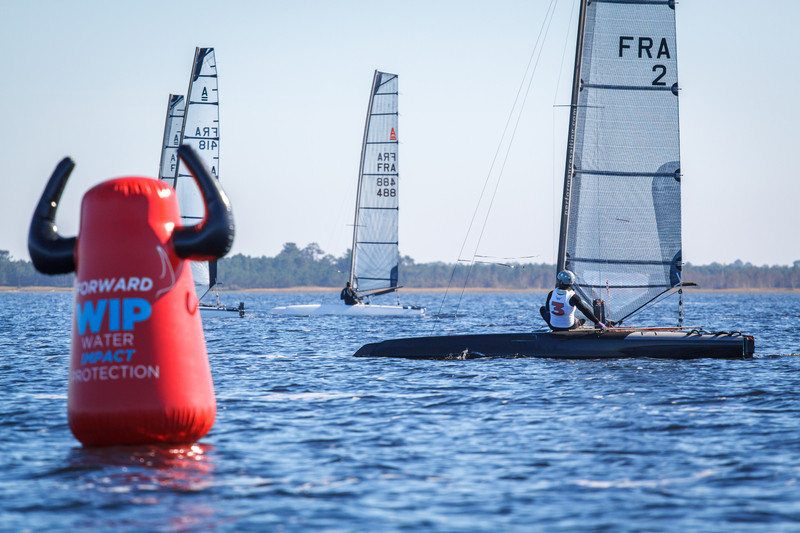 The race was shortened to the last upwind boy. Emmanuel Le Chapelier won ahead of Christian Stock, Lars Schroder and Emmanuel Dodé. Thanks to the committee for the 11 races. Thanks to the club and all its volunteers who made these four days a friendly event that we did all enjoyed. 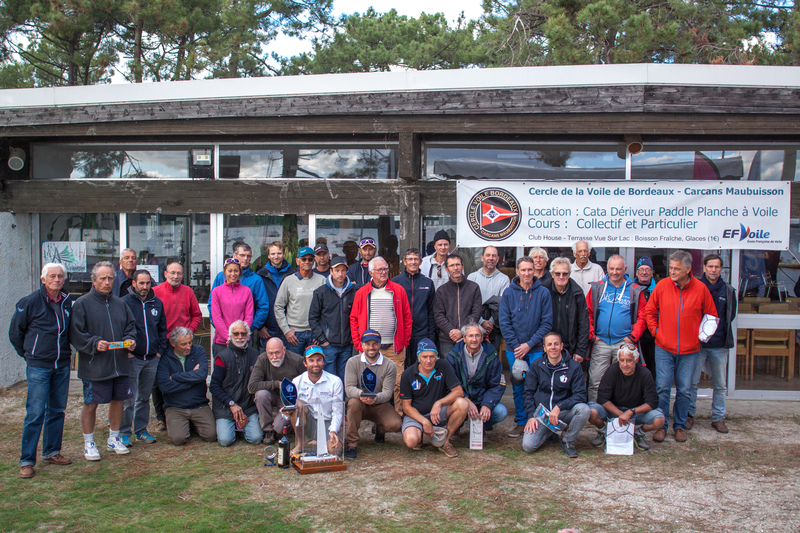 And many thanks to our partners « Proust Sailing » and « Forward sailing » for their support and all the prizes they offered for the final ceremony. So see you all (and others) next year, in Maubuisson, from Wednesday 23 to Saturday, October 26, 2019!